Swipe to the Home screen that still has unfilled area. Tap and hold a blank area until the phone enters Edit mode. Now, put a mark inside the check box beside My Magazine. This procedure will "hide" the service from the Home screen (and stops annoying you), however, it doesn't prevent it from running. So, when you go to the Application Manager and swipe to the "Running" tab, you can still find My Magazine there. It means that it continues to run in the background. Didn't you wish to just kill it? Well, the following procedure will guide you through? Swipe left or right until contents of All tab are displayed. Scroll to and tap My Magazine. Now, tap the Disable or Turn Off button. That's it! 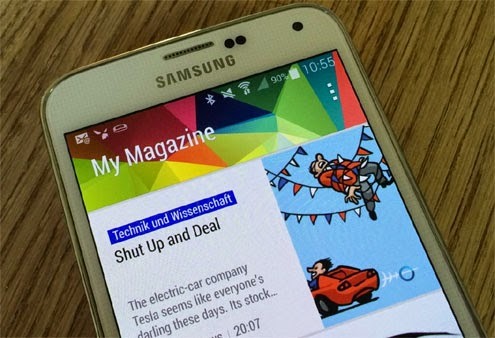 You killed My Magazine on your Samsung Galaxy S5. But please note that its remains remain in your phone's internal storage but they could never disturb you. If you got questions or problems, feel free to email me at harold@droidista.com.